We closed up almost 11 today at 1307.41, coming within 3 points of overlapping [i] down, which seemingly everyone believes would invalidate the bearish count. 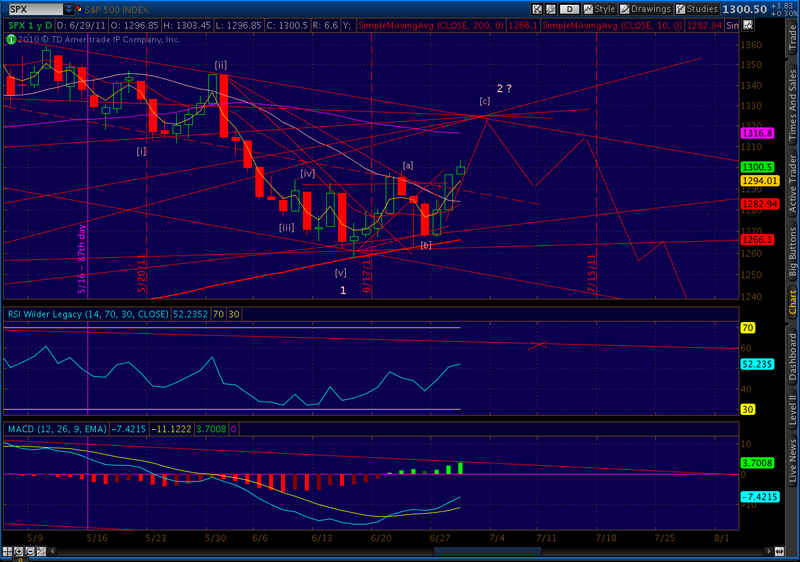 Other indices such as RUT and COMP did overlap this wave. Here’s the daily chart again, with my original projections from a couple of weeks ago in red. There’s absolutely nothing wrong with that conclusion — as long as you’re positive that 1258/1262 was the termination of [iii] and not [v]. 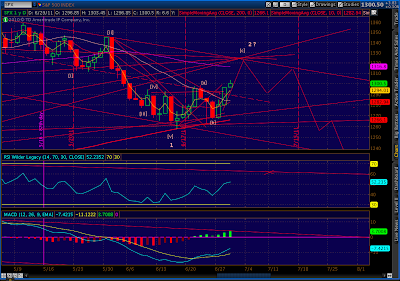 If it was [v], as I contend, then 1 is done and we’re in [c] of a corrective wave 2. To me, the A-B-C move off the lows is pretty clear. I’m not ranting and raving about this count because I know more about Elliott Wave than anyone else. Far from it. But, as I’ve posted for several weeks now, this top is ridiculously similar to that which we experienced in 2007-2008. I’m not going to bore everyone a restatement of the premise. If you have no idea what I’m talking about, go back over the past month and read forward to today. Deja Vu on June 6 is as good a place to start as any. So, where do we go from here? Am I turning bullish? Absolutely not. The intersection of all those fan lines and trend lines is still hanging out there at around 1322 or so (my favorite spoiler candidate is the trendline off the May 2 and June 1 highs.) So is the target of the inverse H&S; set up at the recent bottom. Also at 1322, we’ll have completed both a bearish Bat and bearish Crab patterns I talked about in the recent post about Patterns. Could we overshoot? Absolutely. Once the bears capitulate and/or the margin calls get to be too much, I can easily imagine a higher move. As I understand it, the medium-term bearish case is still alive unless we exceed the May 2 1370 high. And, given that most — if not all — of this bull has been attributable to Fed manipulation, who knows what else BB might have up his sleeves? I’m certain they’ll try; not very sure at all that it’ll work. Certainly wouldn’t bet the farm on it. So, no, I don’t think we’ll establish a new high. I think we’ll stop somewhere shy of 1330 and begin [i] of 3 of (1) of P down. I expect it to take us down to 1300 (any lower would make it difficult to trap more bulls.) The bounce back up, the last bullish frenzy, will falter on or around July 15th (the 87th day) at the above-mentioned trend line — probably around 1310. If this all plays out as expected, look for the low 1200’s from [iii] of 3 down. Once caveat: many are calling this a wave 4 triangle, and I can see the logic in that. If so, we hit the very same targets above. Except, after the bounce from 1310 to that trend line, we keep on going. The one thing that’s been consistent about this market is its propensity to leave the greatest number of options on the table as long as possible. I’ll be watching for that possibility. A study of previous tops tells me it’s a slim, but distinct possibility. Remember, just because someone rants and raves like a lunatic, they’re not necessarily crazy. The market’s taking a breather here as bears, especially EWers assume we’re starting wave 4 down. There’s even a way to draw the trendlines so that looks to be the case. I don’t think it is. I continue to believe we completed wave 1 of (1) at 1258/1262 and are in corrective wave 2. It should take us to 1320 (probably a little higher). IMO this rally isn’t over until we reach the TL drawn off the 1370 high (see the chart below.) Going short now should be okay in the medium/long term, but there is a better entry point waiting just a little higher. VIX puts look like a steal here with SPX at 1202. Here’s where the market is this morning, with my original projections plotted in red. SPX currently at 1303. I’m expecting a backtest this morning, but otherwise still expecting 1320 in next few days. Keep an eye on VIX, nearly back to 18. I suspect we’ll end up closer to 16 by the end of the week as bears capitulate. I’ll be looking for good entry points, preferably in the 15 range. I’ll try to post again at the end of the day. Good luck to all. Any thoughts on why you think your target is hit by Friday? Again the 2007 analog?